In this series of worksheets, students learn about The Romantics. Here they study the poem 'London' by William Blake. 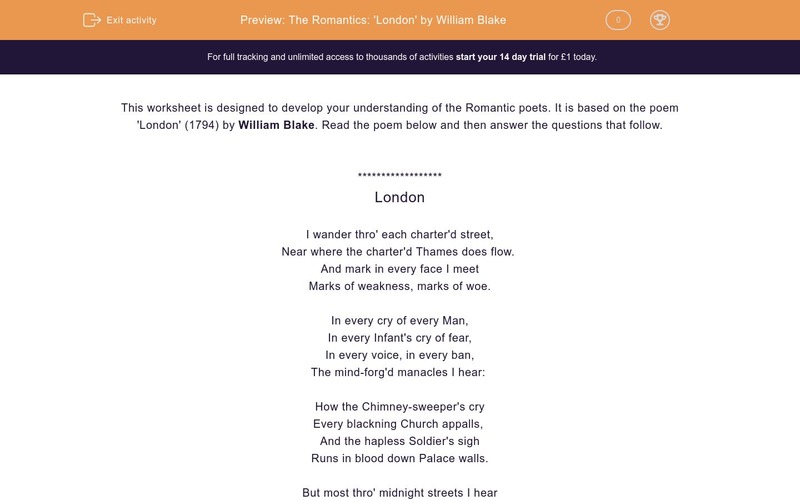 This worksheet is designed to develop your understanding of the Romantic poets. It is based on the poem 'London' (1794) by William Blake. Read the poem below and then answer the questions that follow. In this poem Blake wanders through London describing a series of snapshots of what he sees. Match the stanza with what it is describing. Is the poem a positive or negative description of London life? William Blake creates a negative view of London life by using lots of words with negative connotations. From the list below, select the five words from the poem that have negative connotations. Use a dictionary to help you if you are unsure of any of the meanings. To understand it better, use a dictionary to help you match the words to their meanings. In this stanza the word charter'd is repeated twice. What point might Blake be making? Think about your knowledge of the Romantics and their views. In this stanza, Blake describes the sadness and fear he sees around him in London. What word does he repeat to show that this fear and suffering is universal throughout London? 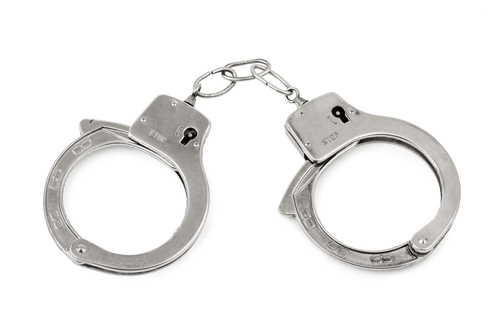 This stanza includes the famous line: "The mind-forg'd manacles I hear"
Manacles are another word for handcuffs. Using this information, which option below best explains the line? Blake hears the prisoners crying out. Blake hears the suffering caused by the government trying to control people's lives and thoughts. Blake hears the ideas people have about punishment. In stanza three, Blake criticises two institutions for not helping the poor people of London. Which two institutions does he criticise? Stanza three has a very bitter angry tone. Blake creates this tone by repeating sounds. What three letter sounds are repeated to create a harsh and bitter tone? He describes how new-born babies are cursed and the final line is very bleak. Match the key words in the final lines with their meanings. The whole poem has a very regular rhyme scheme. This emphasises how controlled the people of London are, according to Blake. Which letter sequence best describes the rhyme scheme? 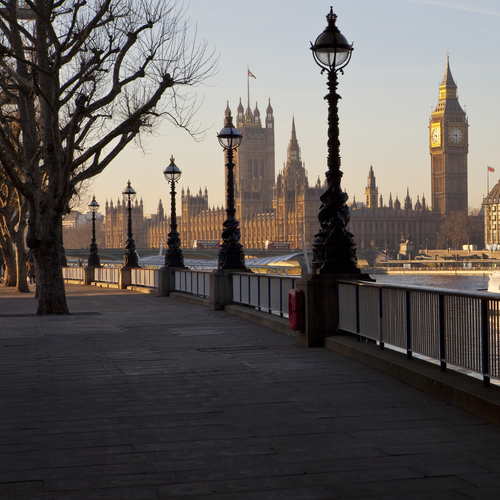 Stanza one describes the streets of London and the river Thames. Stanza two describes the sad, scared people and children. Stanza three describes the chimney sweeps and soldiers. Stanza four describes the babies screaming. The poem describes a very negative view of London. The five words with negative connotations are: cry, weakness, woe, fear and hearse. By repeating the word 'charter'd' Blake is making the point that the government control, and the importance of money is making life in London miserable for many. The word 'every' is repeated to show the universal suffering. The line "The mind-forg'd manacles I hear" suggests that Blake hears the suffering caused by the government trying to control people's lives and thoughts. Blake criticises the Church and the government and Royalty. The three sounds that are repeated are: ch, b and s.